Day 8 begins our focus on book creators for older readers, starting with Leah Henderson whose debut middle grade novel One Shadow on the Wall is due out in June. Leah’s adventuresome spirit and love of stories helped her turn a passing encounter into her first novel. I first met Leah at the Kweli Writers Conference in Spring 2016 when she was an attendee, but this weekend she will be presenting at AWP in Washington, D.C., taking on the timely subject of social justice and activism. 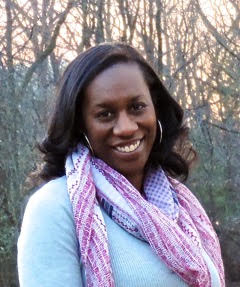 Please welcome Leah to the Brown Bookshelf! My path to publishing cannot be truly understood without first understanding my love of travel. Anyone who knows me, knows that I love to get lost and found anywhere in the world. I have been blessed with the wanderlust bug from a young age due in large part to my parents. From very early on they realized the potential effects of my brothers and me not seeing ourselves represented in the pages of many books we read. So they helped us make our own adventures, taking us to amazing places and stuffing us to almost bursting with the accomplishments of people who looked like us. We saw black cowboys, and traveled to lands with black princesses, learned of black scholars, and toured historically black institutions. But that wasn’t all. My parents enriched us with possibilities, cultures, worlds, and experiences outside our own—Arabian souks and great walls, rickshaws and palaces. These real-life experiences were the first stories I truly loved and held tight to, verbally painting them for any family member, friend, or stranger I could cajole into listening. Then I started imagining my own stories in these places and spaces and began spreading them across notebook pages. While living in Italy on the streets where Michelangelo, da Vinci, and Dante strolled, amongst artistic energy, I tried my hand at writing a novel with the backdrop of Florence’s nightlife as my muse. I spent many hours next to a booming loudspeaker in a club typing away with partiers stopping by to slosh a drink and say, in bocca al lupo (good luck) before stumbling away. As much as I loved working on that novel there, surrounded by friends, I craved a writing community and decided to wander down a new path towards graduate school and an MFA. 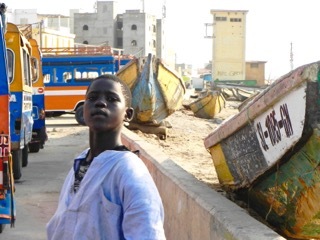 A snapshot taken through a car window in St. Louis, Senegal of the boy who would inspire Mor’s story. Later that day as so many wonderful images collided in my mind, that boy came back to me and without truly thinking about it, only hearing his answers to my question, I wrote a short story about him for a grad school assignment. Although I never imagined that ten-page story would go any farther than my professor’s inbox, she saw a novel and thought I was the one to write it. Every part of me disagreed. Who was I to tell this story about a boy, a place, and an experience I only knew from a distance? Another story about a struggling Africa—although filled with hope—it was still wrapped in sadness, not the diverse beauty, richness, and wonder alive on that continent. 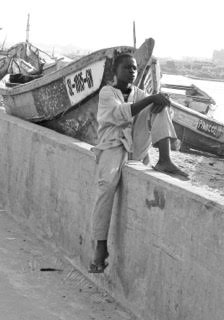 The children of Senegal deserved a story and a writer who could capture their warmth, vibrancy, and charm. I do not scare easily, but writing this novel terrified me, and still does. In my own life, I have opened far too many books where the character that was supposed to look, think, and sound like me was simply a stereotype, a caricature, or a few brush strokes of paint. The pages of those books were supposed to speak about me, and for me to the wider world, lifting me up, when all they accomplished was to hold me in a box, keeping my true life hidden and unexplained. These books let me know what little value those writers placed on me and getting my story right. I did not, and do not want that to be the experience young readers have when they read my words. So I dragged my feet on this project for several months after graduate school. Even with all of my reasons why not, so many people still encouraged me to continue, especially my mentor and friend Lesléa Newman who believed in Mor’s story long before I did. She read every word I wrote, even when I had no clue where they were going. She understood how determined I was to try and infuse the beauty and magic of Senegal into the project if I could. And after many scenes met their demise, I hoped I’d finally written a story the boy on the beach wall could be proud to have inspired. I queried a small group of agents and received a small but encouraging group of personalized rejections in return. Disappointed by their concerns it would be too hard to promote and sell, but not discouraged about writing, I started another project and tucked Mor away. Though I loved the characters I’d created, I still wasn’t certain it was a story meant for me to tell. Almost a year later when our paths crossed, one of the agents who’d first read my manuscript wanted another peek. At the same time I went to a conference where a wonderful editor who’d enjoyed chapters from another work-in-progress asked if I had anything ready. I almost said no, but like so many times before, Mor whispered in my ear to give him a chance. The same weekend the editor wanted to see Mor’s manuscript, the agent expressed interest in representing the project (one knowing nothing of the other). After so many months of quiet, One Shadow on the Wall and Mor had found their way to a corner of the stage. With nudges and well wishes from so many, I signed my first publishing contract soon after, being fortunate again to work with someone who truly believed in Mor and his story. I went back and asked if I could take his photo. He wanted to stand—tall. For me, inspiration comes in all forms and from all directions. Seeing the world and the varied lives of those within it have always had a profound effect on my every step. Photography, especially the work of the Smith Brothers, Gordon Parks, and most travel images, get my mind whirling. Art by Romare Bearden, Jacob Lawrence, Modigliani, Arthur Melville, and Margit Kovács have me ready to build scenes and imagined people. Any music that wraps around my soul fuels me. But books that have left a lasting impression are Don Freeman’s Corduroy where for the first time I saw a likeness of my mother and myself, a character in a room of her own, on an adventure where she was the shero. I have read many books that have gotten me thinking and left me feeling but none so much as Toni Morrison’s Sula, Their Eyes Were Watching God by Zora Neale Hurston, and Virginia Hamilton’s The People Could Fly which has always sat front and center on one of my family’s bookshelves or coffee tables. These books have a rhythm and heartbeat all their own. Not only do the characters and settings transport me, I am in admiration and awe of the souls of these books themselves. Isaac Bashevis Singer once said, “Sometimes I hear a little story, a spark of a story, and then I make from the spark a fire.” And though I am not a Nobel Prize winning writer, I approach new projects in much the same way. I get a twinkling of and idea, sometimes just a title, other times a character, or a certain place I want an adventure to unfold. After that the twinkle will take up root in my mind for a while before I ever attempt to put even one word on paper. Then I’ll scribble down a brief outline, nothing too specific. I like to get lost and found with my characters as much as I can. I love being surprised by where they traverse and what they decide to say. Then I take the plunge. Stop thinking, and start writing. Attempting to make sense of things during a first draft is the quickest way to get me stuck. It’s like a hovering adult when a child is just trying to do her thing. My characters are in the lead during first draft. Then once I have a beginning, middle, and end, I start digging, and building and stretching the mess. And then I clean, trying to make sense of the knots, though not too much. Some chaos is needed. But I also have to remind myself not to get discouraged by that same explosion on the page. That it is just a start. I continue fleshing out scenes, creating new characters, and merging old ones until that first twinkle has grown into a pinhole of light. Then I try and carve more layers into my characters, pluck more details out of my setting, sprinkling new ideas and new possibilities wherever I can now that I know where my characters are going and mostly what they want to say. Then hopefully by the sixth or seventh draft everyone is finally sitting in a flood of light. My hope for children and children’s books is that gatekeepers and readers alike truly understand: the need for more diversity on bookshelves is not a passing fad, coming and going, because we are not a fad. And we will not go. Adding more depths, hues, textures, and voices to any child’s world can only help make it more enriching and the child more empathetic and curious about what other stories are apart of this world she shares. Being able to experience a likeness of yourself in books is a joy and empowerment every child should know (Saturday’s NYT had a piece “Mirrors for My Daughter’s Bookshelf” that sums this importance up well). There are so many marginalized writers who can tell these captivating stories, and my hope is that more of us are given the opportunity in traditional publishing to do so, especially now, in the current climate. It is so vital that the industry understands this and continues to act. We cannot afford for it not to. Brown Bookshelf, thank you so much for this opportunity to tell a little piece of my story. 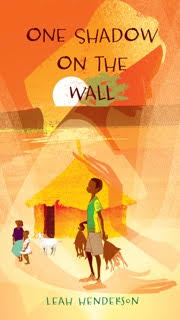 One Shadow on the Wall will be published June 6th with Atheneum/Simon & Schuster and is currently available to pre-order. In the meantime you can find Leah on Twitter @LeahsMark or on her website: leahhendersonbooks.com. Kathy—Thank you so much for this! You have definitely put a smile on my face today!!!! What a beautiful story. Thank you for sharing it all. (And a beautiful cover). I can’t wait to read your tale. I appreciated your need for some “chaos” in initial drafts. Sometimes I think it’s so inefficient, but then I realize the little bits of beauty that can come from unpreditibale connections. I told some students that just the other day despite not entirely trusting it for my own self sometimes. There’s a Jacob Lawrence exhibit at Seattle Art Museum right now. I’ll be headed there soon. Thank you! And please enjoy the exhibit for me too! Would you consider adding a social media share button to your posts? Good idea, Nicole. I’m sure we can do that. I share Ms. Henderson’s fear of Doing It Wrong, even from the perspective of trying to write more stories of color — what if their story isn’t exactly MY story? — but I think that giving voice to an individual is an act of hope and keeping in mind one’s intention and purpose will help to avoid the pitfalls inherent in the writin. I have high hopes for this book and can’t wait to read it. Thank you for this! So appreciated! I’ve been looking forward to ONE SHADOW ON THE WALL since I first met you at Highlights last year, Leah. June is too long to wait! Loved learning more about you and about the inspiration for this novel. Leah! Congrats on finding a place for your story! I can’t wait to read it! No wonder you left picture books behind. You had this story to tell. And I loved reading about how you evolved and how this book came to be. I’m so excited and thrilled for you! Can I use any more exclamation points? Cheers! Thank you everyone for reading this post and for your excitement about ONE SHADOW ON THE WALL! It truly warms my heart!